School Based Occupational Therapy |The goal of school-based Occupational Therapy (OT) is to optimize a student’s performance and participation in the school environment. A student’s occupation in school is to learn and participate as independently as possible during all parts of the school day. 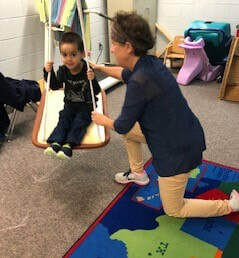 School based occupational therapists and occupational therapy assistants (under the supervision of the occupational therapist) help students who have fine motor, visual perceptual/motor, and/or sensory difficulties that interfere in the school setting. OT supports academic and non-academic outcomes including reading and writing (i.e. literacy), math, recess, self-help skills, behavior, social skills, prevocational/vocational participation, and more. OT’s expertise includes activity and environmental analysis and modification with a goal of reducing the barriers to participation. Referrals for OT are generally made by the classroom teachers. A school based evaluation is completed including standardized testing, clinical observations, the student’s strengths and needs are determined and if appropriate, goals are written. OT offers services along a continuum of prevention, promotion, and interventions and serve individual students, groups of students, whole classrooms, and whole school initiatives. They collaborate within the education team to support student success. In this way, occupational therapy practitioners can contribute within both general and special education. Some children may quality for therapy in a medical/rehabilitative setting but if their disability is not impeding school function, they do not require OT services. It can be confusing trying to determine what is educational-based verses medical-based occupational therapy. ​Educational therapy focuses on interventions to improve the student's ability to learn, participate, and function in their educational setting. School-based therapy only works on skills necessary for a student to function in school independently. These services are more of a "top down", outcome-based, approach. Rather than rehabilitate a deficit, the therapist facilitates access to curricular and extracurricular activities through support. the OT may adapt and modify the environment or offer the teacher strategies to implement on a daily basis. If a student need occupational therapy to address problems but the problems do not prevent student from benefiting from the educational program, school-based therapy should not be provided. Conversely, medical-based therapy focuses on treatment to alleviate or cure underlying medical issues. Therapists identify the underlying deficits of a problem and then address them through rehabilitative activities. The medical model is more of a "bottom up", remedial, approach. The therapist identifies the building blocks and attempts to repair the deficits for improved function. What interventions have been tried and what was the impact of these interventions on student performance? A very important component of RTI is data collection. Data has to be collected to support whether those interventions are effective. If those interventions are unsuccessful, further information will be needed to determine the student's abilities and what other interventions or strategies could be put in place.